Elderly and vulnerable people in residential care homes are being left in re-used continence pads, denied trips to the toilet and kept indoors for days on end because of severe staff shortages, according to a survey published by UNISON. The vast majority (83 per cent) of care workers say they are so rushed they are compromising the dignity and well-being of the people they look after. This is despite many staff (80 per cent) regularly working through their breaks. The findings are based on survey responses from more than 1,000 care staff working in private and local authority care homes across the UK. Staff providing public services are being forced to cut back on groceries,borrow money from friends or family, and even go without meals to feed their children because the government has capped their pay, according to a survey from UNISON. The survey is released to coincide with the first day of UNISON's national conference in Brighton. Dave Prentis, General secretary, will call upon the government to lift the pay cap, and undo the damage its pay policies are causing. The research is based on responses from more than 6,500 employees including paramedics, teaching assistants, council workers and police staff across the UK. The survey highlights how years of wage restraint have left many struggling through to the next pay day. 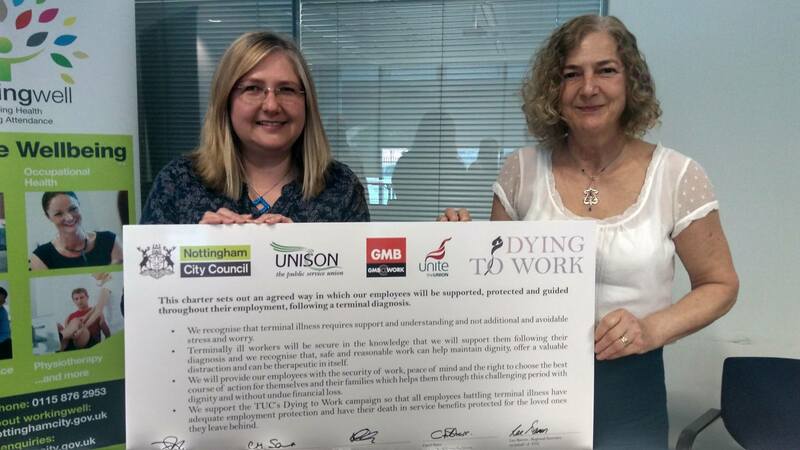 Nottingham City UNISON is really pleased to have signed the TUC Dying to Work Charter alongside colleagues from Unite and GMB, and the City Council. It will mean that our members will be treated with the dignity, care and respect they deserve when they are diagnosed with a terminal illness. Knowing that they will have employment, and death in service benefit protection will give them peace of mind and avoid needless stress and worry.